NYC’s Planning Commission: Rubber Stamps or Checks and Balances? Before a neighborhood rezoning can become law, it must be approved by two entities: first, the City Planning Commission, and then the City Council. 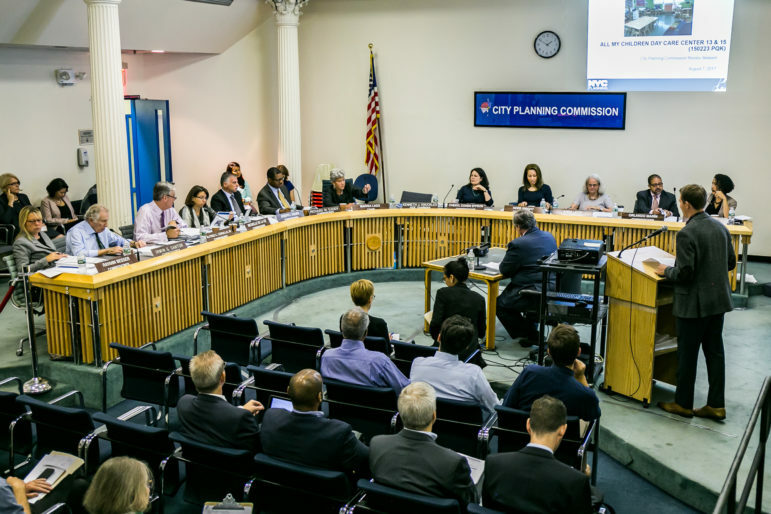 While onlookers spend a great deal of time speculating on the Council’s position, it’s often assumed that the City Planning Commission will give the greenlight. When Bloomberg’s rezoning proposal for Williamsburg reached the City Planning Commission in 2006, it was approved by a vote of 11 to 2. De Blasio’s controversial rezoning proposal for East New York? Approved 12 to 1. Mandatory Inclusionary housing? Approved 9 to 3, with one abstention. With the commission to deliberate City Hall’s proposed rezoning of East Harlem in the next few weeks, residents may be wondering whether the commission’s thumbs up is anything but inevitable. After all, the commission is a body with the majority of its members appointed by the mayor and chaired by the mayor-appointed director of the Department of City Planning (DCP), the agency spearheading the rezoning. Some residents might ask, as one citizen said to City Limits last year, isn’t that “essentially [DCP] policing itself”? According to the New York City Charter, the commissioners are “chosen for their independence, integrity and civic commitment.” There are thirteen in total, with seven appointed by the mayor, one appointed by each of the five borough presidents, and one appointed by the public advocate. All members but the chair, who stays in the position for as long as the mayor wants, serve for staggered terms, each five-years long but with no term limits, and can only be removed for misconduct—a structure that provides them, at least in theory, with autonomy from their appointers. The commissioners deliberate and vote on projects sponsored both by private developers and by City Hall. They are the third stop in the Uniform Land Use Review Procedure (ULURP) through which a zoning change is approved—after the non-binding recommendations from community boards and borough presidents, and prior to the ultimate City Council vote. The fact remains, however, that the commission’s structure is intertwined with the mayor and with DCP. It’s been that way since it was first formed in 1938, and for valid reasons. Once we dig into the history of the commission, it becomes clear that the real question to ask is whether the commission is successfully living up to its original purpose: to serve no one’s agenda but the public’s, and to guide the city’s planning decisions in the interest of long-term citywide goals. There are some who say the commission is succeeding now more than ever—and others who believe the commission is falling short. Seeking to entrust planning to an entity “as independent of political control as possible,” the charter writers created a body consisting of six mayoral appointees, each serving eight year terms, and a seventh member, a chief engineer. It was tasked with creating a “master plan” for the city and crafting the city’s capital budget. Its chair would also direct a new agency, the Department of City Planning, filled with “engineers, architects” and other technical experts who would carry out the commission’s duties. The Board of Estimate retained the power to have the final say on all land use decisions. 1930 – Mayor James Walker signs a bill creating a planning department, but it’s abolished in three years thanks to depression-era cuts. 1936 —A new city charter says long-term planning decisions must not be made solely by politicians catering to local and special interests. It lays out the structure of the City Planning Commission and an accompanying Department of City Planning. 1938 – The City Planning Commission and DCP begin to function. 1940s-50s — Urban planner Robert Moses serves on the commission. Many reform groups try to remove Moses from the commission due his multiple conflicts of interest. 1975 – Charter is revised, requiring City Council to confirm Planning Commission appointees, and that the commission include at least one resident from each borough of the city. The Uniform Land Use Review Procedure (ULURP) is created. 1989 – Board of Estimate is ruled unconstitutional. The planning commission’s structure is updated to ensure borough presidents and the public advocate each appoint one member to the commission. 2002-2012 — Commission undertakes a huge number of neighborhood rezonings under Mayor Bloomberg. 2014 – Commission works on Mayor de Blasio’s neighborhood rezonings. After the Board of Estimate was eliminated in 1989, the structure of the commission was updated to ensure each borough president and the public advocate had the opportunity to appoint one member. The commission, in other words, has always played a complex role—mostly as a body of independently minded technocrats, but also as a proxy for the mayor, and later, other elected officials. From its beginning, the commission has included a variety of individuals from diverse fields. The current body includes several government professionals with experience in finance and development, a realtor, a business man, an engineer, a developer, nonprofit community development leaders, former community board members, and real-estate consultants. For all except the chair, the job is part-time and pays in the ballpark of $60,000 a year. In terms of race and gender, it might be the most diverse it’s ever been. The commission had no female appointees for its first 22 years. Now it’s a multiracial body and seven of the thirteen members are female. Several people familiar with the commission emphasized the transparency of its decision-making process: All the commission’s discussions are open to the public and videotaped, with that tape posted both online and broadcast later by NYC-TV. And those mayor appointees that agreed to speak to City Limits said that they were never told by the administration how to vote on land use matters. “No one has ever indicated in any way shape or form how I should vote,” said one on condition of anonymity. “But I generally vote in favor because I get to a point where I understand” DCP’s perspective on the land use action it is proposing, they explained. Another appointee, similarly, said they’d never voted against either a private developers’ or a City Hall-sponsored project. Of course, it’s only natural that mayor-appointees’ opinions would often coincide with those of their appointing mayor. A review of the City Planning Commission’s voting records on a few of the most controversial land use actions sponsored by Bloomberg and De Blasio found that mayoral appointees voted for these mayor-sponsored proposals, while other appointees only sometimes voted against them. Anna Levin is Manhattan Borough President Gale Brewer’s appointee, but she too voted to support De Blasio’s proposed East New York rezoning, which City Hall has argued will ensure future development is required to include affordable housing, but some, including the community board, feared would trigger displacement. Levin points to the importance of establishing controls on development before the market moves in. “That discussion is a very complicated one and there’s merit on both sides to it,” she says. She adds that she takes the feedback of community boards extremely seriously. It’s especially helpful, she says, when boards craft “constructive recommendations,” lay out their objections in a “careful and thoughtful way,” and attend the hearings to voice their concerns in person. A board that just checks the approve or disapprove box, she says, is often less likely to be taken seriously by the commission. Ronald Shiffman, who served on the commission in the 1990s, says the success and independence of the commission ultimately depends on commissioners’ dedication to persistent inquiry. Pratt Institute’s Eva Hanhardt, who worked for the department on-and-off from the late 1960s through the early 1980s, is concerned that over the years, DCP’s planning work and, as a result, the commission’s output, has become less comprehensive, more about facilitating development through zoning, and more a function of mayoral priorities. Handhardt acknowledges that it’s not like developer interests didn’t sway planning in the 1960s and 1970s, or that DCP and the commission were always deeply grassroots. After all, it wasn’t until 1975 that community boards were first given the formal opportunity to weigh in on the land use process. And there were certainly outcry about large-scale rezonings spearheaded by appointees of City Hall then as much as now: In 1969, then-chair of the commissioner Don Elliott backed a rezoning of Manhattan’s Second Avenue that prompted major resistance, including by a rebellious group of staffers at DCP who signed a petition stating the rezoning would take “valuable inner city land where poor and working people live and work to construct profitable housing for rich people,” according to a quote of the petition in the Times that year. Still, Handhardt says that several legislative changes have altered DCP and the commission’s roles. The 1975 charter revision divested the commission of the responsibility to prepare the city’s capital budget. The passage of the State Environmental Quality Review Act in the 1976, and the subsequent creation of the city’s City Environmental Quality Review (CEQR) Technical Manual to guide environmental analysis of land use projects, might have seemed a step forward for comprehensive planning, but Hanhardt believes it may have caused DCP and the commission to focus more on following the manual’s imperfect rules rather than actually planning comprehensively. Indeed, it’s no secret that today DCP considers the commission’s purview solely “land use” issues, though the definition of land use is not set in stone. There was also the shakeup of the government’s structure in 1989. One might think the commission, now including appointees from the borough president and public advocate, would have at that point grown more independent from the mayor. Yet because at that time the Board of Estimate was eliminated and City Council gained the power to have the final say on land use decisions, Hanhardt suspects that appointed chairs began to regard the commission as part of the executive branch, rather than as an independent technocratic body. Overall, Hanhardt fears these changes resulted in a “less participatory view of the planning process, and one of more implementing a mayoral agenda.” What didn’t help was that the entire country, under then-President Ronald Reagan, entered a period of vastly reduced spending, making it more difficult for the city to undertake large-scale planning or taxpayer-funded public works. Marilyn Gelber, who worked for DCP around the same time as Handhardt and also served briefly as an appointee on the commission from 2001 to 2002, is also concerned about the narrowing of the commission’s focus over time, and says commissioners are not given enough opportunity to question other agencies beyond DCP about aspects of a land use project’s impacts. Others, however, might argue that if the commission has become less independent from City Hall, that’s not necessarily a bad thing, especially given the strong role that the City Council now plays in the land use process since 1989, and the importance of counterbalancing citywide with local concerns. Michael Levine, a consultant to Manhattan Community Board 1 who worked for DCP in the late 1960s through 1990s, recalls earlier, independent-minded commissions and agrees the commission may be closer to the mayor in this era, but feels the balance is appropriate. “I think right now we have an excellent commission that is responsible and is responsive to neighborhood needs and tries to balance them with the mayor’s [agenda],” he says, adding that today’s commission is more in touch with community boards and local concerns that the commission or the Board of Estimate had been back in the 1970s. He does, however, agree that “we don’t do as much comprehensive planning as we used to.” The issues facing the city have become more complex, the department has lost its power over the budget, and staffing levels have not increased to what they need to be, he says. Shiffman, appointed in 1990, was one of the first commissioners to serve in what Hanhardt sees as the commission’s new era. Recalling the 1990s, he remembers his frustration with the narrow definition of “land use” concerns held by some staff at DCP—definitions that allowed for a discussion of things like a developer’s allowable density, but not community concerns like needed investments in transportation. “Particularly those that have been brainwashed by the Manhattan Institute crowd want very narrow perspectives,” he says, referring to the conservative, free-market think tank. Appointed by then-Mayor David Dinkins, he recalls being told that he could vote as he saw fit, though should always inform Dinkins in advance if he was going to oppose a project. His term ended in the middle of the Giuliani mayoralty, at which point, he recalls, he was told then-Deputy Mayor Fran Reiter that if he wanted to be reappointed, he should vote the way Giuliani wanted him to vote. “I told Fran Reiter at that time that I was appointed to be independent and I will vote my conscience,” he says. He was replaced a few months after his term finished. Levine, consultant to Manhattan Community Board one, however, praises Burden, whom he says worked closely with Community Board 1 to create a rezoning plan for Tribeca that allowed residential and commercial use of what Levin described as a vacant manufacturing area. There is general consensus that debate has been more robust under De Blasio’s first appointee, Weisbrod, and his successor, Marisa Lago. Gelber says she believes Weisbrod “remembers the way it used to be and…was trying to restore city planning to be more of an entity that was more deeply involved” in comprehensive planning.” Shiffman sees other good signals from Weisbrod’s successor, Lago, who took over in March. 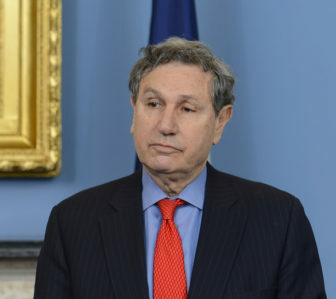 Weisbrod, for his part, depicted a nuanced relationship between himself, as chair, and Mayor De Blasio. He says that that while DCP and the commission chair are charged with implementing De Blasio’s general policies, that the mayor also looked to them for guidance—and never tried to dictate Weisbrod’s vote on specific land use actions. “The mayor did not contact me ever (not once!) on an application that was before the Commission while I was there,” Weisbrod said in an e-mail. The de Blasio administration has also made efforts to restore some elements of comprehensive planning to the city. One of Weisbrod’s first actions was to create a capital budget division within DCP to work with the Office of Management and Budget to determine a ten-year budget strategy. The two agencies created the city’s $1 billion Neighborhood Development Fund for improvements in neighborhoods targeted for a rezoning. Furthermore, each of the studies launched under Weisbrod have brought other agencies to the to address multiple aspects of a neighborhood’s quality of life. While the commission’s purview may still be just “land use” issues, de Blasio has also linked land use to affordability requirements with the passage of the mayor’s mandatory inclusionary housing policy. And questions about other aspects of a project—such as access to jobs created by a development—also show up during commissioner’s discussions and in the commission’s reports. Of course, there are still many other aspects of planning that fall outside of the commission’s purview. In the case of neighborhood rezonings, it’s often left to City Council to negotiate with City Hall for a variety of other community benefits—and community residents aren’t always left satisfied by the results. Commissioner de La Uz, who voted against the East New York rezoning, is aware of these concerns. To some, the changes under the De Blasio administration in the planning department and at the commission are positive steps, but still insufficient to serve the best interests of the city—a criticism especially aimed at the mayor’s neighborhood rezoning efforts. They argue that the citywide goal of creating housing has been unfairly placed on neighborhoods of color—and that the rezonings might fail to meet the goal, and instead displace longtime residents. For some advocates, the issue is the enforceability of agreements made between City Hall and City Council outside of the zoning text that is approved by the commission. While De Blasio has taken unprecedented steps to codify those agreements in digitally-accessible memoriams, it’s true that they’re legally non-binding. Furthermore, some feel that mayoral goals—like, creating the promised 80,000 units of new rent-restricted housing—has superseded a more careful consideration of conditions within each neighborhood. According to the 1938 City Charter, creating a master plan for the entire city, and holding hearings to solicit feedback on that plan, was the original intent of the City Planning Commission. “Comprehensive planning took a real beating because of urban renewal,” Hanhardt says. Yet, she insists: “we really need to have a citywide plan, a citywide framework that goes through an open discussion process”—one, she says, that is built from the bottom-up, the product of vigorous neighborhood-level involvement as well as open debate and discussion on how to meet citywide needs. It’s a vision that challenges the long-assumed dichotomy between the concerns of the neighborhood and those of the city as a whole. Of course, any kind of citywide planning today would take place in a political context that is different from earlier years, with still far less federal financial support than prior to the Reagan era. Many are skeptical that citywide planning is feasible in a city as complex and dynamic as New York City. Yet, such an effort initiated by the commission would at least allow a public discussion of whether we are choosing the right neighborhoods for the strategy of rezoning, and what steps are necessary to truly confront the risks of gentrification and displacement. These many questions will remain on the table in the next few weeks, as the City Planning Commission considers DCP’s proposed rezoning of East Harlem. SEE UPDATED LOCATION AND TIME: The City Planning Commission will hold a hearing for the East Harlem rezoning proposal on Wednesday August 23, 2 p.m. at 1 Centre Street, Manhattan. *Correction: Originally neglected to mention that the city comptroller was also on the Board of Estimates. After reading the report on NYC’s Planning Commission: Rubber Stamps or Checks and Balances? I’m in favor of improving the quality of life in low-come neighborhoods but not at the expense of gentrification and displacement. The words re-zoning and affordable housing is misleading to the residents that will be impacted by this plan to re-zone Jerome Ave., in the East and West part of the Bronx. This plan is looking to build affordable housing, the question is, affordable for who; those making $100,oo0 or more a year or, the present residents who income is less than $25,000 a year. It is my belief that private developers should not be involved in rebuilding communities. I suggest or recommend that Community-Based Developers should be involved in the process of re-building low- come communities. It’s imperative that the Mayor’s office need re-consider whether the Tax-Abatement given to private developers during the 1980’s and who actually benefitted from this luxury endowment. I hope all parties are able to decide what’s fair and equitable for everyone involved. There is an upcoming meeting with the City Planning Commission on November 29th, 10:00am to 2:00pm. Residents are pushing the city to slow down plans for the redevelopment of the area surrounding Broadway Junction so community demands can be taken into account. Some participants took issue with the Department of City Planning’s argument that without a rezoning, the neighborhood won’t get affordable housing.